Traphagen offers portfolio strategies for all levels of risk tolerance and return needs from the most conservative to near S&P 500 risk level strategies. Even though our portfolios are unique on a security by security basis all are governed by the same asset allocation process and core philosophy explained here. Below you will find a graphical representation of all our portfolios plotted against risk and possible investment returns. We cannot directly control returns, although over the long term the more calculated risk taken the higher your returns should be. 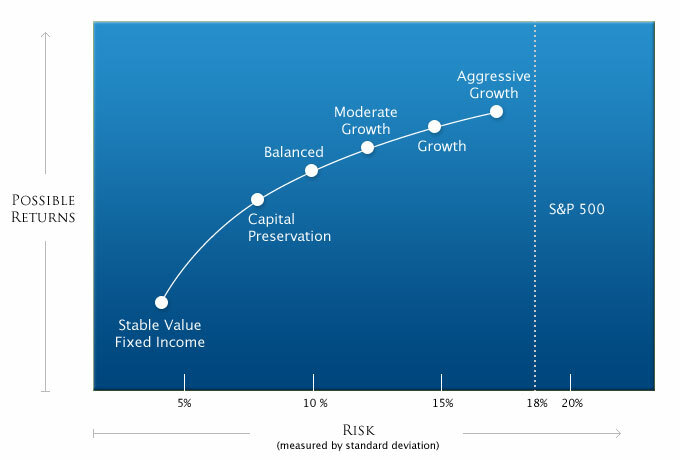 We can, however, control your overall portfolio risk to any level we desire. Our main objective as your portfolio manager is to maximize the after tax total return of the portfolio given a pre-determined level of risk. Click on portfolio titles for a more detailed description of objectives.